When it comes to spring, I like to overhaul my make-up and beauty regime. But this year seems to have been lacking in…actual spring. 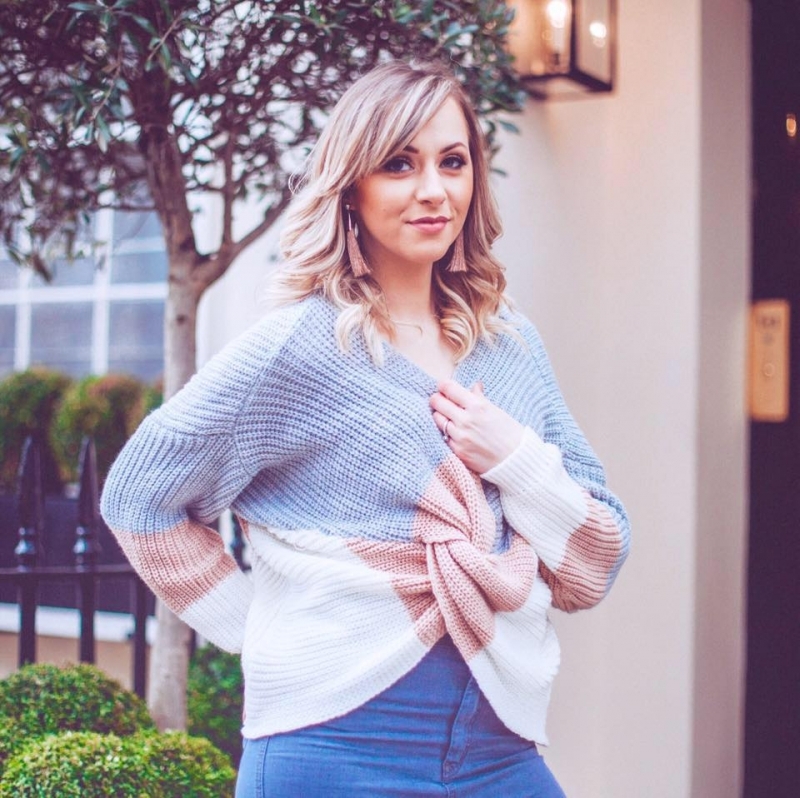 The constant rain, grey skies and cooler weather have meant most of us have been stuck wearing our coats and boots longer than usual and I for one have stuck to my autumn/winter make-up palette more, with warm, dark toned eye looks and deeper lipsticks. 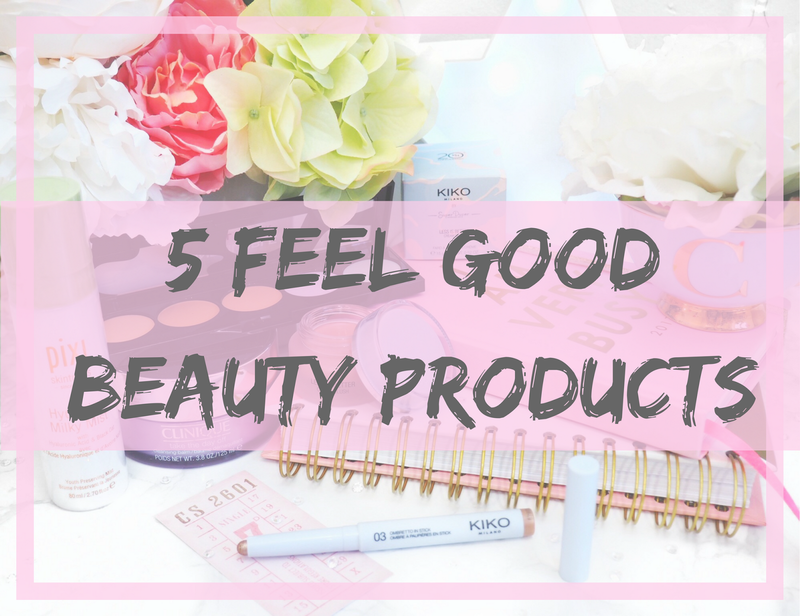 However it’s sunny outside today, so I’m taking all the spring vibes I can get, and using it as an excuse to talk about 5 feel good beauty products for right now – because if we can’t rely on the weather as a pick-me-up right now, we can always rely on our beauty products! I don’t know about you guys, but nothing makes my skin feel as good as when it’s been well looked after. I do admittedly have days when I just run out of time (or steam) and the skincare will slip, but the Pixi Hydrating Milky Mist is such a quick step in skincare, that even on my lazy-girl days, I still manage to spritz it over my face – it literally takes a couple of seconds and you’re done. Apply morning before make-up application, and night after removing your make-up and your skin will get a burst of hydration. It’s such lightweight mist that you don’t even feel it, and it’s a great sensation to apply – really refreshing and just makes your skin feel good. Not only does this apply as a primer-like barrier before make-up, but for me I love it in the evenings because it’s like giving your skin a little pamper before bedtime. And you can sleep knowing that your skin will thank you for it. Feel good skin in seconds. We all have bad skin days (I have bad face days!) where blemishes, bags and dull skin tone can make us feel a bit…meh. One thing that’s guaranteed to make you feel good about your skin again is make-up that allows you to hide those imperfections while we wait for them to clear. A good colour correcting palette is perfect for this, and I really like the L’Oreal Infallible Total Cover Concealer Palette. Not only because it’s great value at approx £12.99, but because it’s got two colour correcting shades and three skin tone shades to allow you to colour correct the offending areas, but then also conceal them afterwards too. I find it’s best to apply with a brush or beauty blender for the maximum affect. A great little feel good palette, giving you everything you need to feel good about your skin again. For me, blush is one of those make-up products that instantly makes me feel good. A bit of colour in my cheeks and even if I feel awful, I know that at least I’ve got a healthy looking bit of colour in my cheeks. I’ve not used a huge amount of cream blush before, but the KIKO Less Is Better Cream Blush (shade 01 Impalable Rose) has been a really lovely discovery for me. It’s a mousse-like texture when applied but settles like a powder. I like to add a tiny dot to the apples of my cheeks and blend in with a beauty blender to get that healthy, feel good colour. It’s a really delicate pink shade, which is just so pretty and feminine and so universal for skin tones. It’s taken me a while to get used to applying it perfectly, but less is more and a small amount of product goes a really long way. Feel good rosy cheeks – done. If you want a feel good eyeshadow that takes seconds to apply and gives a lasting finish, then the KIKO Less Is Better Long Lasting Stick Eyeshadows are ones for you. I’ve got shade 03, Metallic Rosy Copper and it’s the most stunning pigmentation. It’s also one of the smoothest eyeshadow sticks I’ve got in my collection – it literally glides on with high colour payoff in an instant. I absolutely love this for a quick and easy feel good make-up look because the metallic finish is so striking – one swipe and you’re done for the day. 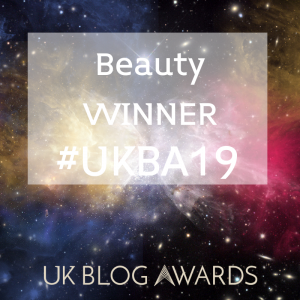 Being a more creamy texture, it might need a mid-day pick-me-up where it has creased, but it’s worth it because you’ll feel good about your eye make-up all day. Plus, once dry (which takes literally seconds) it doesn’t budge or blend, so you retain that metallic finish throughout wear – great performance. If you like metallic eyeshadows, you’ll absolutely adore these and for £6.90 they don’t break the bank either, so your pocket feels good too. I’ve been using this for a little while now and was then kindly sent a new one last week – so I’m stocked up for the summer. Thankfully though, because nothing makes me feel as good about taking my make-up off, but this works like a dream. At the end of a long day, there’s something really satisfying about removing my make-up with this as opposed to anything else. The Clinique Take The Day Off Balm comes in a pot and at first inspection it looks like wax – and you wonder how it’s going to work. But upon contact with the skin it ‘melts’ into an oil-like texture and removes all make-up, including mascara, and even things like suncream too. It breaks it down to remove all traces and rinses off without feeling remotely greasy. Call me odd, but starting with a wax-like balm that melts to an oil and removes all traces of the day…it’s so satisfying to use! My skin feels good and I feel good using it because I can actually see it removing even the tougher make-up. Win/Win. So those are my 5 feel good beauty products for right now, with this little collection of goodness my skin looks and feels happy – regardless of whatever the weather (or my skin!) is doing. Would you like to give any of these a go?